Cupcakes 'n Daisies: Baby Basket . . . .
Love the little rug mug! Too cute! Love the new project that you are making too. You don't need to enter me in the drawing, but I just wanted to let you know that we have had close to 70 inches of snow and it just keeps coming!! Cute mug rug! I wouldn't be using it either. I don't drink coffee, tea or hot drinks but if I did I still wouldn't use it. It's too cute. What a darling idea....a basket within a basket. Here in Tulsa we have had two new weather records broken: the most snow fall in a single day of 14 inches and the lowest temperature ever of -6 degrees. Our poor city has been moving at a crawl. How is the needle turn applique coming? I can't wait to get a peek! What a cool invitation, Thelma!! I'd love to quilt along with you! I printed off your baskets and the post of how the quilt evolved....you are one fun designer! It's going in my "inspiration notebook" so that when I'm thinking a block or top needs a certain "sum'thin'-sum'thin'" I'll have your wonderful ideas! We've have snow in Kentucky -- not as much as you, and still not enough in my very humble (and not so popular!) opinion. The inch we got last night isn't enough to keep me from going into my part-time bookkeeping job. Alas! But I'll get back to sewing when I get home. Here in North Dakota, we've had lots of snow. I think we've had snow on the ground since before Thanksgiving. Right now, we have two to three feet of snow in most places in our yard and drifts that are five to six feet deep. Yesterday was rather warm with a high of 85 and a low of 67. First time the ac was on in 2011. Today will be a more typical February day in Florida as it is only going to be 68. The rug mug is adorable. I would use it as I am a tea drinker. I have the fabric for Eventide but not the pattern. It is on my to do list this week. The mug rug is soooo cute! We've had less snow that you have so far - maybe about 12-15 inches total from 2-3 smaller storms. I would love to quilt along with you and love the pattern. I'm in Nebraska and we've had about 20" of snow, less than normal but the cold has been brutal! Thanks! Cool giveaway! I sew along with you in a heartbeat, Thelma! :-) Thanks so much! We have had way too much snow. Weeks ago it was well over 40 inches. It is in the minus degrees right now. I love your cute little mug rug. 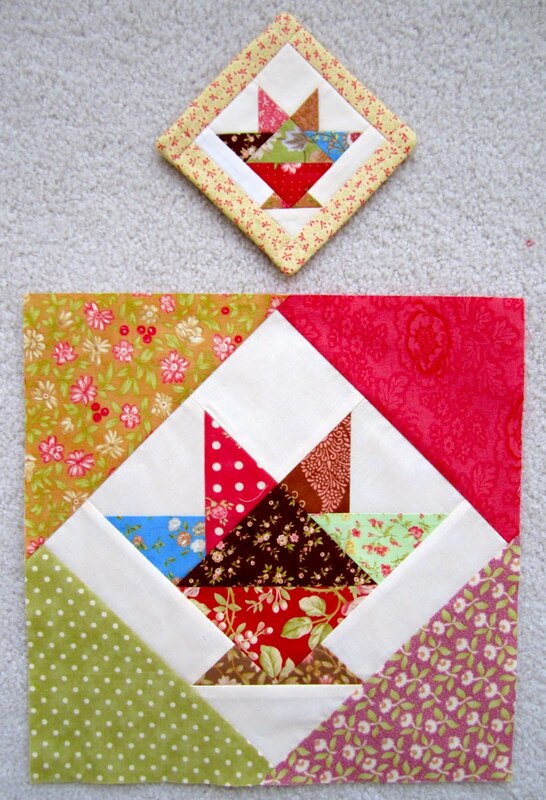 The block within the block would make a cute little wall hanging, or on a mini rack that sits on the counter. I've asked my LQS to order Eventide. I want to do that pattern too. I think it's one of Carrie's best. If it arrives in time, I may consider quilting along with you. Great pattern! What a fun giveaway, maybe you'll get more than one of us to sew along with you. I'm sure we've had more than 20 inches of snow this winter and it just seems to keep coming. I just added a picture of Erik clearing snow from the garage roof to my blog, he did the house too....hopefully he won't have to again its so nerve racking for me! Thelma, your quilts are amazing, and you do so much! Oh, to be like you. We have had way less snow than that as we live in South Carolina, but we did get 6 or more inches at once. I don't like it. Thanks for the giveaway! I would love to quilt along with you on this project!! I love the pattern--it's just great. We had an amazing 5 inches of snow here in Atlanta! That is a ton for Georgia lol! 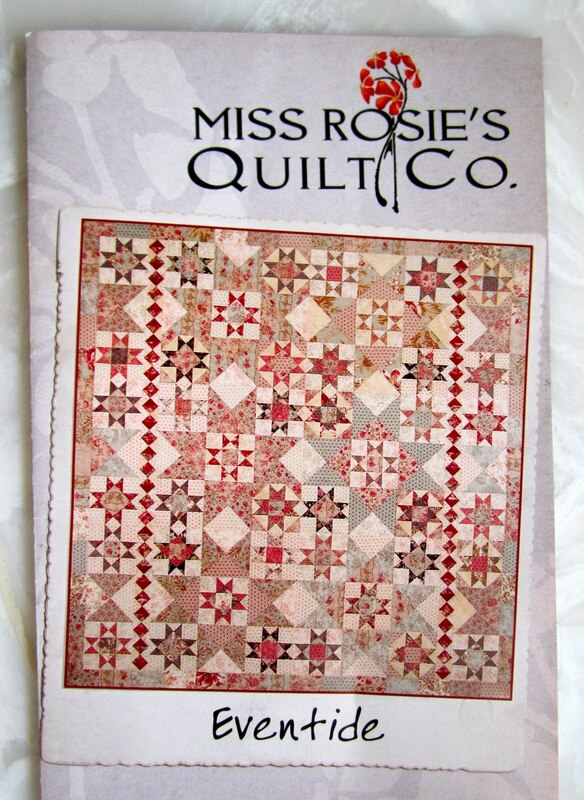 I would love to quilt along with you on this Carrie Nelson, my fav, pattern! I'm already thinking about the colors to match my master bedroom since I haven't made a quilt for in there yet. As for snow, we've had about 7 inches total this year in my corner of NC. OH my goodness...I have so many things to say but I have to get to work! First...we have had MORE snow than you and it is so pretty and sparkly outside today. Second I love this pattern - love the large background stars and the darker framing chains that run down the sides of the quilt! Third...LOVE your mug mat...it is beyond adorable! Gotta run...have to scrape the snow and ice off the car windows and get to work! I would love to sew along with you. This winter we have had about 46 inches of snow just in January and the beginning of February. We had a couple of inches this morning. Very beautiful but the weather is going to get really cold from this afternoon through Friday. A new quilting project would help the winter pass. The Laundry basket quilt is on my list to do. I love your cute mug rug. Forgot to ask what are your fabric choices for the quilt? I love the colors you choose for your quilts. I would love to win the pattern and sew along with you! I really enjoy Miss Rosie patterns, just sent one I made bigger (into a queen size, the Lucille pattern) off to be quilted! We have had more than 30 inches of snow so far, and it seems to snow more every day lately...ready for spring anytime now! Aren't Carrie's patterns wonderful? I would love to do a quilt along. I know we have had way more than 22 inches here in southern MN but I am not sure how much more. I do know that we have had 11 inches in just the last week. we have to creep into intersections because the snow banks are so high that you can't see around them. The high today is supposed to be zero. I am so ready for spring. A quilt along sounds like fun. I love Carrie's patterns and Eventide is very pretty. Thanks for the opportunity to win. I'm thinking "blue"
The baby basket is absolutely adorable. And way too cute to put one of my drippy coffee cups on. Can you imagine stains on that pretty thing? When are you planning to start Eventide? I want to make it too, but just started another project. Don't add my name to your drawing, I already have the pattern and wish to see it go to someone who doesn't already have one! I have yet to make a mug rug, although they seem to be all over the place. What a great idea to play with a small project after finishing a large one. I just always seem to have so many different ones going on at the same time, I feel like I rush from one to the next. As for snow, we've gotten less than you, but here in NC, it's snowed way more than we're used to. deleted my first comment because I forgot to put how much snow we've gotten! I think we're sitting around 18 inches for the season so far. More. We've had almost 3 feet so far at my house. For the "official" total for the state, is like 50+ inches. Not pretty. Don't go over to Nicole's blog... she showing off her lovely street with its flowering trees, green grasses and SANDALS on her feet. NO FAIR! OH! I wanted to say how CUTE your mug rug is! I will have to try a basket block. I haven't attempted one yet. I got a giggle out of your term "Thelma size" the pattern - great one! Eventide is beautiful, I saw a sample on display at a quilt show. Are you going to use Luna Notte or do you have something else in mind? Love the small basket block. You've inspired me to start on that pattern soon. I saw Carrie's Eventide last week in person and LOVED it! Are you doing it with the Luna Notte line also? I would be interested to see it made up with something different also. Either way you can't go wrong. I'm in Utah - and we've been hit hard with the snow. I would think more than 22 inches....lucky us! Thanks for the great giveaway. The closest snowfall I could find was the ski resorts, which are about 15 miles from us - around 100 inches. We haven't had quite that much down here, but a lot. I love the mug rug. I'm thinking that would make great Christmas gifts. What's the finished size? Love the mug rug. I've been thinking about doing a few just for fun. You've given me some inspiration! I have had a lot less snow than you..living in coastal South Carolina makes for good weather most of the time. 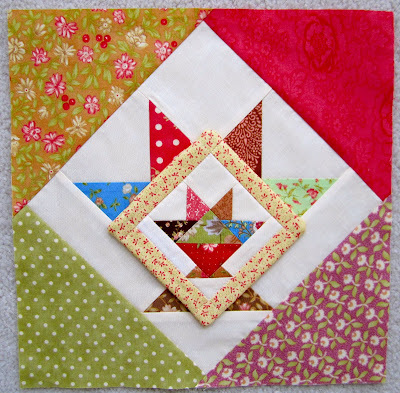 I just love Miss Carrie's quilt patterns and would love to quilt along with you. Love that tiny little basket! I think you have a great idea on how to use it too! Fortunately, we have have had very little snow in my neck of the woods, Paradise California. Any snow we had melted within 3 days. We had just enough to cover the ground and make the yard look pretty. A sew-along sounds go to me! 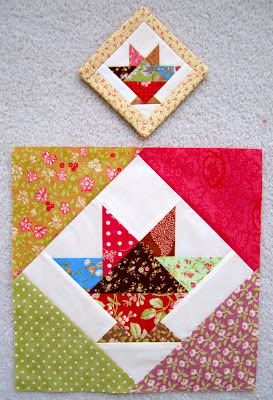 Love this pattern and I, too, love smaller blocks! As far as snow goes, well, in New Orleans, we are lucky to see it every 12 to 15 years!!! And when we do, well, I just don't even want to think of the nightmare it is here!!! NOBODY knows how to drive in it and they all think they CAN!!!! Carrie Nelson patterns are like treasures to me! I would love to win this! Your quilts are gorgeous, and I'm really tempted to do that Belle Meade this year! Thanks for all your inspiration! Looks like you have a lot of ladies ready to join you in a sew-along. I would make it in purples and greens...there are 2 new lines out from Moda, Dragonfly Summer and Lilac Hill. Can't go wrong with Miss Rosie. 20 inches of snow? That's amateur hour. We, in NH, have had 84 inches so far. The piles along my driveway are over my head. The record for most snow in a winter was 120 inches and with February being the snowiest month I'm guessing we'll break that record. Oh Joy! Your mug rug is so adorable!! We have had lots of snow this winter, I don't know how many inches but for the moment there is only a light skiff out there...and blue skies. What a great idea for a basket in a basket. You always amaze me. I have the Eventide pattern but also still need to buy my Luna Notte fabric for it. Do you think I would have to buy a fat quarter bundle ? What are you planning on buying for it ? your baby basket is just too cute -- love it! eventide is a lovely pattern, can't wait to see what you do with it. In Moorhead MN we are at 51 inches -- which will contribute to a very severe flood this spring! A separate question though: When you find a pattern you really like, like Eventide, how do you file it in your list of projects to do? "I'd like to finish it in 2011" "I'd like to start in March" or is there no system at all? I'm a relatively new quilter, and I can't seem to prioritize everything I want to make! We have had snow on the ground since the first of December. I don't know how many inches that is but it is snowing again today-UGH. I love Miss Rosie patterns and don't have that one. Would love to win it. I don't think I would be able to put a mug on that mat either. Too pretty. I was looking at a flicker site with lots of pictures of those mug rugs and I was feeling like I needed to make one but then I kept thinking I would not be able to use it and the feeling went away... LOL! I love the size of Eventide. I would love to make that too, but I need to finish Opening Day first! I was thinking of starting on Elizabeth but I controlled myself. Then I wanted to start on my Toulouse, but I also resisted! I am getting so good at resisting those urges. But I'm getting a bit weak in the knees for Brown Eyed Girl. Oi! Well, I think we are about even with snowfall. We had just under 17 last week (I am near Chicago), and 2 more a couple of days ago, and it has been snowing all day - about 5 more inches so far. 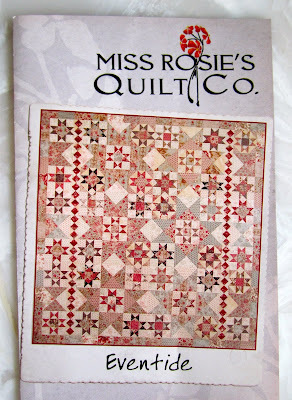 I love Miss Rosie's patterns, and am seriously thinking of ordering this one! The mug rug is adorable and I am a basket fan so I might just have to try your brilliant idea at least for one block! I have had quite a bit less snow than you, but more for us this year than usual, I think we have probably had a total of about 10". Hello from sunny but freezing St. Paul, MN. Happy to report 50+ inches of snow. Hope it all melts slow for the northen MN friends who will suffer through flooding if it doesn't and for my southern MN family so it soaks into the farmland for spring planting. Love your blog by the way. Hello Thelma, I am not a "blogger" yet! I love to read all the quilting blogs and yours is one of my favorites. Your little "mug rug" is sweet. I would love to work on this quilt as you do. I live in South Bend Indiana and we have had 95 inches of snow so far this winter. I spend much of my time digging out and am ready for a new project! Have a good warm day. I love Eventide very much, but haven't bought the pattern yet. Would love to win the pattern and I think I will do the sewalong than too as it is fun doing a project together. We had a record amount of snow in Canada, too (I'm in Alberta). The piles of snow along our driveway are taller than I am (almost 6 feet). I would love to win the pattern for Eventide and it would be fun to work along with you on it. Oh no! You're making another quilt I want to make! Laundry Baskets, Belle meade... Nottingham Star, and now this! I don't need the pattern, ( I have it in my must do file ) but I'm curious~ Are you going to post goals and updates so everyone can keep together?I've never done an online stitch along. We've had 33.4 inches of snow in Indianapolis this year! The 7th snowiest year on record. The mug rug is so sweet. I would love to sew along with you. Thanks for the giveaway. What a good idea - I'd sew along with you. That's just what I need to get moving. What fabrics are you using? That pattern has been on my list to order for a while. I just love it. And I always love seeing what new project you're starting!! Inches of snow - oh my goodness I don't know - we got about 12 a week ago, and then 6 more inches a few days later, then another two inches, and then about an inch, and that was on top of about the eight inches we already had. I'm so sick of this cold and snow, but it does give one the opportunity to hide with fabrics and play! I'd love to have this pattern, I debated with myself recently - between this pattern and HeartLand. Every time you show a new pattern, I want that one too! Snow forcast for Charlotte area Wed night. Has been a cold winter for us. I live in Erie, PA and we've had close to 100 inches of snow! I love the star pattern and have never seen this particular one. I would love to win it! Thanks for having a give away! I definitely would like to sew along with you. I already have the pattern and the fabric, AND started this project with Carrie when she was in Michigan. It has been sitting, and I think you are just the inspiration I need! I'd love to sew along with you! I don't know how much snow we've had, but we got 12" last week, so I'm pretty sure we've had more than 22" this winter. We have no place left to put it at the edge of the driveway. Spring can come tomorrow as far as I'm concerned! your baskets are soo cute. The pattern is beautiful and your view looks like mine has since mid Nov with no end in sight. Your mug rug is so cute I wouldn't want to put a mug on it either. I love the quilt you are working on. I may have to try that one. But I will love the opportunity to cheer YOU on and watch your progress. This is going to be lovely! I will be so happy to win this beautiful pattern, I am a big Carrie Nelson's fan. I would love to win this pattern - it is just beautiful! The Park Avenue fabric line would really do the pattern justice. I'm in Washington state and thankfully we haven't had much snow this winter. Too many hills and too few snow removal machines and too many people who don't know how to drive in the snow = major disaster from even a few inches of snow. I live in Western Washington and have had very little snow. Don't know why we were missed and I really feel for those that are still struggling. No fun when you get socked so hard. Love your pattern give a way. Looks like a great stash buster. Just what I need to lessen that stash. 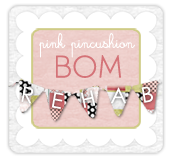 while following your belle meade adventure with nicole at sister's choice, I thought it would be fun to be part of a sew along. so, count me in! i'm a snow lover but most of it seems to be going right on by us this year. we did get about ten inches two weeks ago. We have gotten 25 inches this morning in NW Arkansas!!! Record breaking snow fall and a very good excuse to stay in and sew. 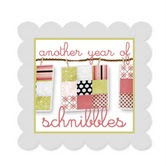 You are such an inspiration with blogging about your quilt finishes. Carrie Nelson has such wonderful patterns... Thanks for the give away. We have had 3 snows this winter in Eastern NC, one is the norm. Expecting snow tonight and tomorrow ! Love your mug rug. no snow at all :-) i live out in california--and it's sunny and cool today--my favorite kind of weather (not gloating or anything :-) carrie nelson is one of my favorite designers and it's always fun to see what you come up with in interpreting her designs! Cold and snowy here in north Texas. I love the Eventide pattern. It'd be fun to do. after seeing your post just now with this quilt oh I just love it and would love to win the pattern so I can join in and make it too! 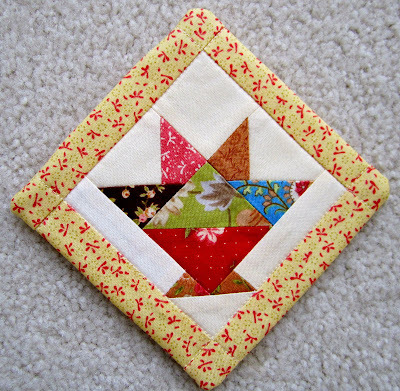 your mug rug is adorable, isn't it fun to make little blocks! I need to make a rug mug this one is adorable.